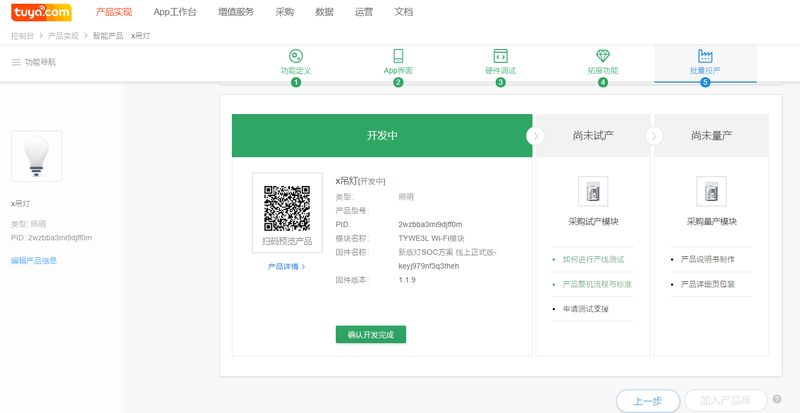 Brand owners and manufacturers can order required materials, such as hardware modules and licenses on the Tuya Smart platform’s Purchase module if they have completed product development and need small or large batches of modules for trial or mass production. 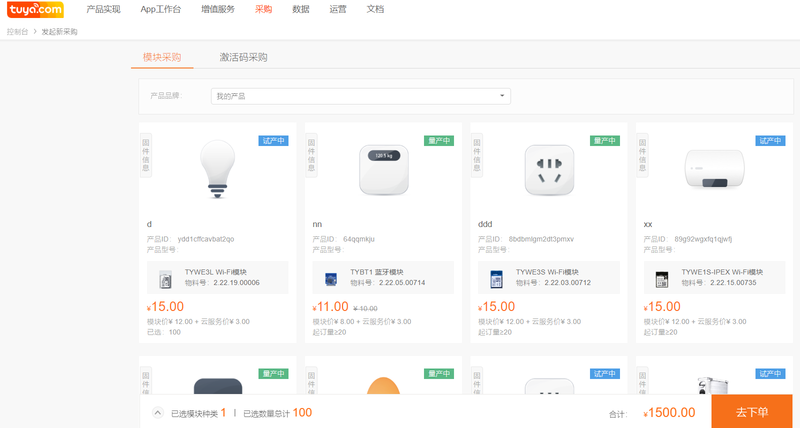 After Tuya’s business manager confirms their online orders, signs contracts offline, and receives a deposit, Tuya starts to produce the ordered hardware modules. High efficiency: To purchase a batch of modules, submit an application directly on the Tuya Smart platform. The platform notifies your Tuya business manager of your application, saving your communication time. Accurate information: To purchase a product, choose Purchase > Purchase module or Purchase license, and specify the purchase information. The Tuya Smart platform automatically obtains correct purchasing information (for example, the quantity, delivery address, and invoice) and production information (module and firmware information), preventing incorrect product delivery or firmware burning caused by manual recording or oral communication. Traceable order status After you place an order, you can view the order status on the Order Management page and check the production progress. Historical order query Tuya provides a snapshot of each order, which can be used to prevent duplicate ordering. Note: Online purchase supports hardware modules and IPC licenses. If you have any suggestions, tell your Tuya business manager. Tuya will continuously optimize the functions to meet your requirements. Specify your Tuya account to log in to the Tuya Smart platform. Click Purchase and select Purchase module or Purchase license to order your required product modules or licenses. Step 1: Enter the model number of each product. Each Tuya product has a unique product ID. You may order modules based on the product model. The entered product model number can help prevent incorrect ordering. On the Product page, select a product and click Edit Product Information on the left of the displayed page. Enter the internal product model number. If products of the same model number need to be delivered to multiple customers, enter the product model number and customer name to prevent incorrect ordering. After entering the information, click Save. Step 2: Update the trial or mass production status of products. On the Product page, select the product to purchase. On the displayed page, click Mass Production. Click Complete development in the Developing area. In the displayed dialog box, click Complete development. The product status changes from developing to trial production. To purchase the product in bulk, choose Purchase > Purchase module. Step 3: To allow a buyer to place an order, set the buyer permissions, that is, generate a login link, account, and password for the buyer. Click the account icon in the upper right corner and choose Subaccount. On the displayed Subaccount Management page, click Create New Subaccount. In the displayed Create New Subaccount dialog box, enter the user name and login password. For example, set your company name as the user name. Click Complete, set permission now. On the Permission setting page, select Buyer and click Confirm. Send the login link, user name, and password to the buyer. The buyer can now log in to the Tuya Smart platform and purchase products. Step 4: Set products of your brand owners (customers) to be visible under your account. Scenario 1: Order product modules under your company name in trial or mass production status. Select My products from the Product’s brand drop-down list box. Select a product to order, select the number of modules to purchase, and click Add to order. Select other product module models and quantities and click Add to order. After you have selected all required modules, click Submit. Enter your PO No., batch No., model No., material model, and other required information. If you require an invoice, enter the invoice title and click Submit the order. A purchase intention order will be generated. 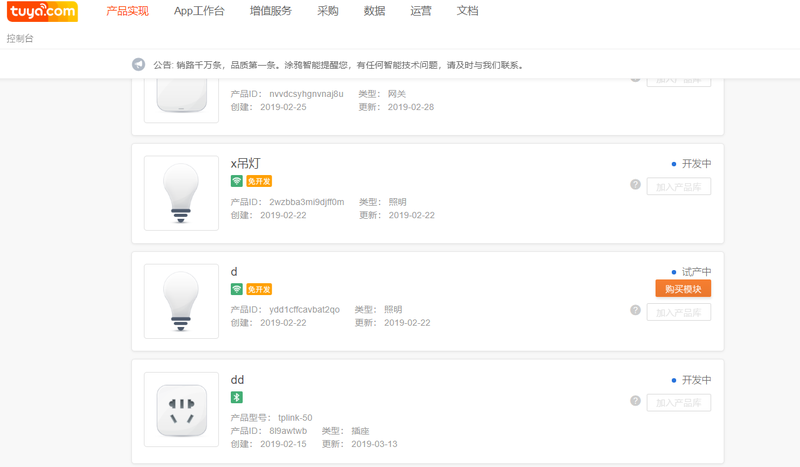 The Tuya business manager will confirm the order details, and the Tuya project manager will confirm the software version information. If the order information is incorrect, click Cancel order and place the order again. To view the order status, click the account icon in the upper right corner and choose Order manage. In the order list, click details of the order. After you place an order, your Tuya business manager will receive an SMS message or WeChat message about your order and immediately process it. After an intention order is generated, your Tuya business manager will receive a message and confirm the price, quantity, and module information with you. After you place an order, your Tuya business manager will receive an SMS message or WeChat message about your order and immediately process it. 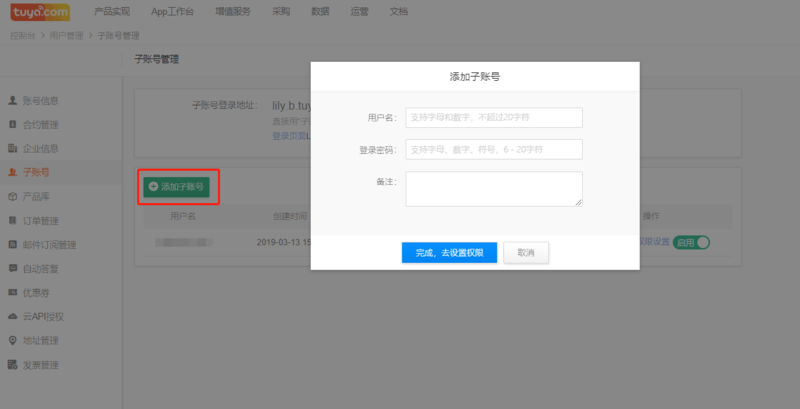 If the intention order information is correct, download the product purchase contract from the order list and sign the contract with Tuya. If the order information is incorrect, cancel the order and place the order again or ask Tuya personnel to modify the incorrect information. Pay for your order at one time or pay the deposit first, either online or by offline bank transfer. 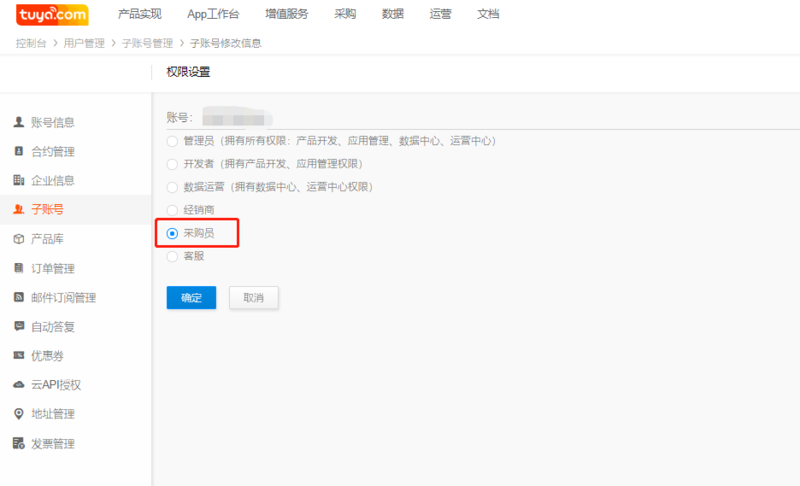 If you use the offline payment mode, pay for the Tuya account specified in the contract. Online banking or third-party payment platforms are supported. If you require a special invoice, select online banking or offline bank transfer. Note: Using either the online or offline payment method to pay for an order. Simultaneous online and offline payment for an order is not supported. If you select online banking, the online bank page will be displayed and you may need to insert your USBkey. View your order status on the details page of the order. 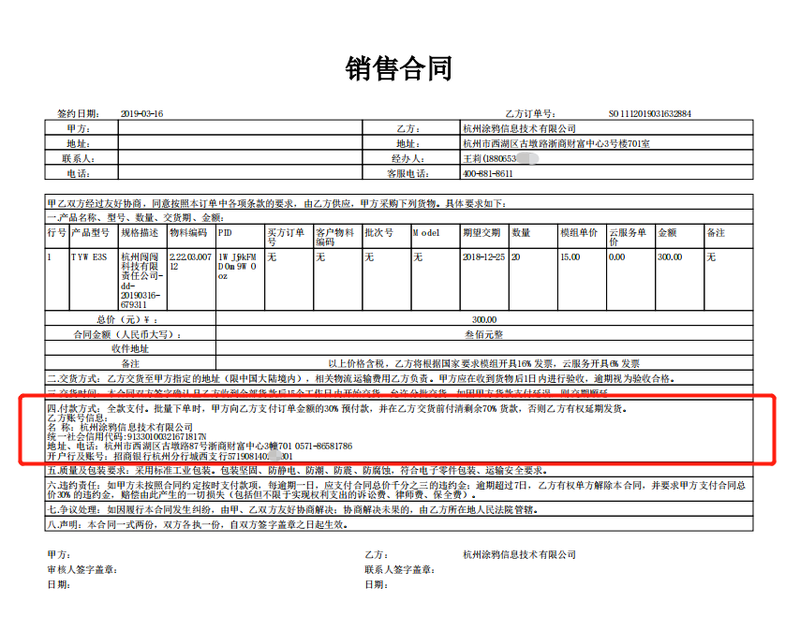 Tuya will issue an invoice after you confirm the order. Scenario 2: Order products created under other brands (your customers). Inform your Tuya business manager or project manager of your order requirements and customer names. The Tuya project manager will associate the brands’ products with your company name in the background before the project is completed. 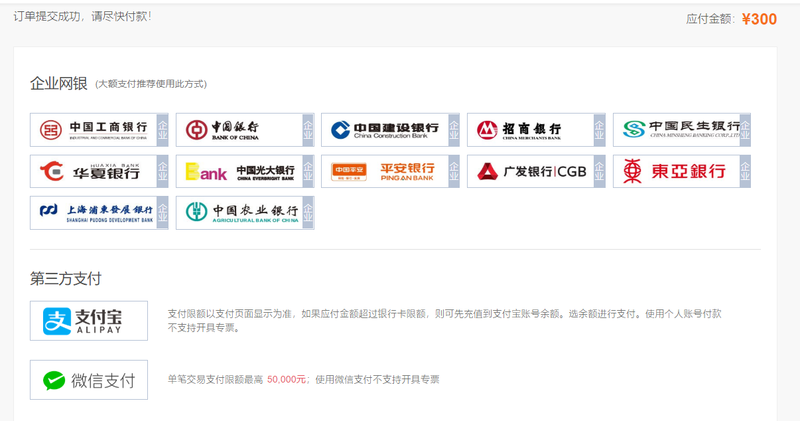 After the association is completed, the brands’ product modules are available for you on Purchase > Purchase module.